Colorado’s Amendment 36 proposed to switch Colorado’s representation in the Electoral College from winner-takes-all to proportionality. We evaluate unilateral and uniform switches to proportionality both from Colorado’s perspective and from an impartial perspective on the basis of a priori and a posteriori voting power measures. The present system is to be preferred to a unilateral switch from any perspective on any measure. A uniform switch is to be preferred to the present system from Colorado’s perspective on an a priori measure, and from an impartial perspective on an a posteriori measure. The present system is to be preferred to a uniform switch from Colorado’s perspective on an a posteriori measure (with some qualifications), and from an impartial perspective on an a priori measure. We conclude with a discussion of the appropriateness of these measures. Felsenthal, D. S., & Machover, M. (2000). Enlargement of the EU and weighted voting in its Council of Ministers. 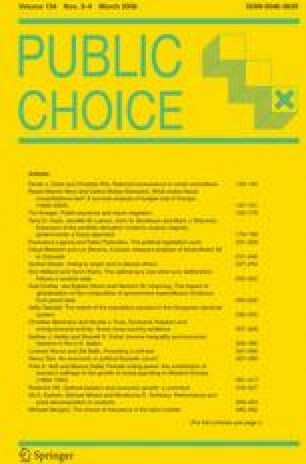 Voting Power report 01/00, London School of Economics and Political Science, Centre for Philosophy of Natural and Social Science, London; downloadable from http://eprints.lse.ac.uk/archive/00000407. Strömberg, D. (2005). How the Electoral College influences campaigns and policy: the probability of being Florida. Working paper; URL: http://www.iies.su.se/~stromber/ElectoralCollege.pdf, consulted in 3/2007.